Virtual solutions are ideal for IT professionals who are looking for consolidation and cost savings. The Barracuda Email Security Gateway Vx is a comprehensive email security solution that blocks email-borne attacks, while also providing the extra features needed to ensure business continuity. The Barracuda Email Security Gateway Vx includes spam and virus blocking, data protection, email continuity, DoS prevention, encryption, and policy management— combined to deliver a complete solution. As new requirements emerge, it is automatically updated with new capabilities to ensure continuous protection. 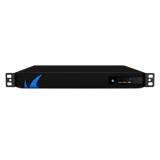 The Barracuda Email Security Gateway provides multi-layer security, email continuity, and data leakage prevention. Advanced Threat Protection combines behavioral, heuristic, and sandboxing technologies to protect against zero-hour, targeted attacks and ransomware.